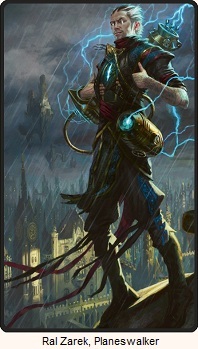 Ajani has a new toy, and it's time to introduce Esper. The planeswalk took quite a lot out of Ajani , and when he looks around and feels the lair he's appeared in seems safe, he goes to sleep, then and dreams of the past. "We Wild Nacatl need to reach out," Jazal was saying. "Reach into the white mists that enshroud the mountains, and touch the hands an minds of the Cloud Nacatl on the other side. That mist is a blade It divides us. It wounds us every day that we are two peoples instead of one." 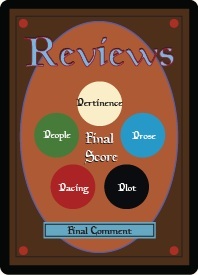 He goes on to say that Marisi was right to reinvigorate the wild spirit within the nacatl, but completely abandoning the Coil and destroying Anatali was wrong. The ruins are haunted and he tells Ajani that can no longer go there. Ajani is startled as his brother swings a double-bladed axe at his head and he wakes. Ajani takes a look around and sees two near identical axes laying against the wall. One blade was a dark metal attached to a broken and repaired again axe handle, the other a gleaming silver. This is Jazal's lair. Ajani's axe handle is weakened from the damage Tenoch had done to it, but Jazal's axe... he'll never use it again. Ajani undoes the bindings on axe and attaches it to the bottom of the other axe to create a new weapon, the double-headed axe from his dream. His brother's voice reminds him about Tenoch and Tenoch's mother. He reminds him about his vengeance. Some old vedalken mage is quite content with his life as a simple lighthouse keeper. But when three men claiming to be Seekers of Carmot arrive, things change. They're quite an important sect of the Esper magocracy, dedicated to searching for a rare material called carmot which they claim will allow them to produce more of the essential metal known as a etherium. The lighthouse keeper reads the letter they hand to him and he immediately calls out to his assistant and tells him quite soundly that his services will no longer be required. His assistant doesn't understand and is quite upset at the lack of followup information as he packs up his belongings and leaves. Ajani knows that Chimamatl has always wanted to her unliked son to become kha. And Jazal and Ajani have always been in the way. She has to be responsible. 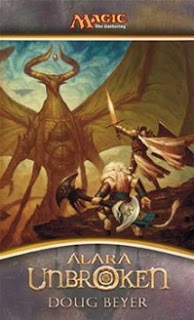 Ajani storms up the trail to her lair, forcing his way through her snares and blinding spells, determined to meet her. Around a bend his instincts sense danger, but what? He's started as a thicket comes to life and attacks him. He chops away with his axe and attacks every which way he can, but the thing just won't budge or even seem to take any kind of serious harm. Anger burns within Ajani , and all of a sudden he senses the power within the mountain beneath his feat. A power that wants to explode. 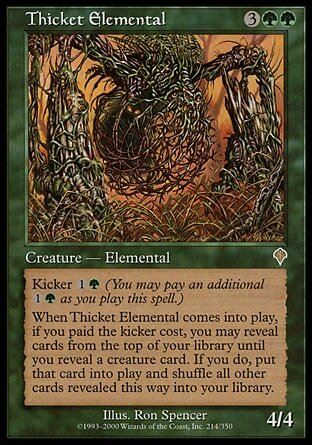 Without fully understanding what's going on, the thicket elemental bursts into flame. The lighthouse keeper understands that a telemin, otherwise known as a mage doll, is someone who willingly gives up his body to be controlled by another. He sees quite clearly that if he refuses he'll be taken to court, but they tell him to ignore it. He has to do this willingly or it won't work. They tell him all they want to do it take routine measurements of the sea currents, but he knows that's not true, and they know he knows. The lighthouse is his life, he has no choice. He agrees to the plan, ignorant that these are agents of the great Nicol Bolas . First his brother's death created his initial rage, then Sarkhan Vol showed him how to be free, and now dreams have brought him his double-bladed axe and he's cast his first red spell. Ajani's come a long way from the little boy being picked on by the playground bully. The question is what will he do once he's claimed his vengeance? He's quite blinded by his tunnel vision of vengeance at the moment but he's always questioning his place in the grand scheme of things. 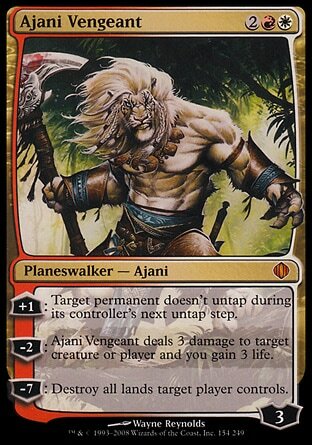 It feels as if Ajani's vengeance is actually his way of avoiding his mid-life crisis. 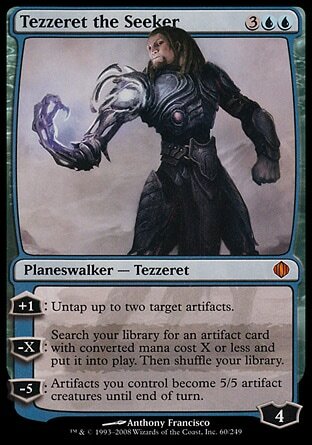 We've finally been introduced to Esper and the Seekers of Carmot, the same sect that gives the original Tezzeret the Seeker its name. But we can't get too attached to our lighthouse keeper friend. 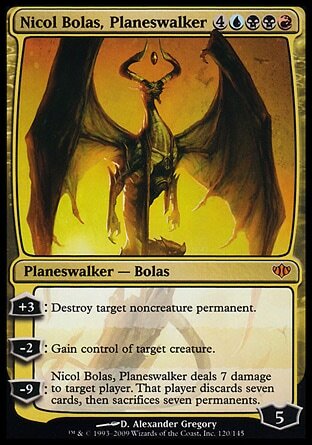 He's just a pawn of Nicol Bolas and it can't be good that he hasn't been given a name in after two segments.